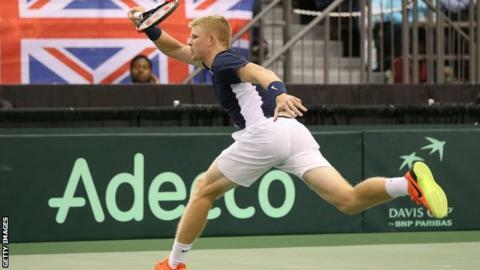 British number three Kyle Edmund progressed to the Delray Beach Open quarter-finals with victory over Taiwan's Lu Yen-hsun on Thursday. Edmund, 22, won 6-3 3-6 6-2 in a rain-delayed match to set up a last-eight tie against top-seeded Milos Raonic. The Canadian beat Croatia's Borna Coric 6-3 7-6 (7-2) in Florida. At the Rio Open, Britain's Jamie Murray and doubles partner Bruno Soares beat Marcus Daniell and Marcelo Demonliner 6-4 6-2 to reach the semi-finals. They will face Argentines Andres Molteni and Diego Schwartzman next. Meanwhile, British number four Aljaz Bedene lost 7-5 7-5 in the second round of the Open 13 in Marseille to Frenchman Lucas Pouille.